Sam Hill, CEO of MegaCorp, calls in his PR guy. This is a conversation that many corporate types have been having for a while. Thanks to Al Gore, ‘The Green Issue’ is now top-of-mind for many companies and a lot of big corporations are looking for ways to inject some sense of environmental awareness into their operations. But some of the results are more amusing than anything. Wal-Mart would, of course, be my favourite example. 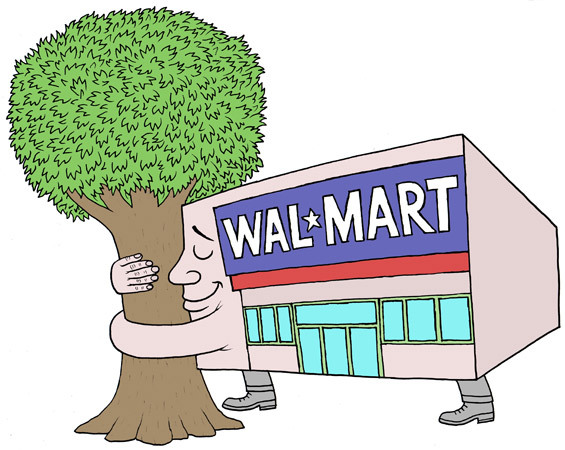 The world’s Premier Purveyor of Pointless Purchases now says that it will spend money to preserve one acre of wildlife habitat for every acre it develops and that it will keep ‘scorecards’ relating to the sustainability of the electronics it sells. No word about Wal-Mart operating its own electronics-recycling program. No mention of what land the company will preserve. So, maybe it will pave over wildlife habitat or farmland in the US, and ‘spend money’ to save one acre in, say, Outer Mongolia? On its website, Wal-Mart crows about its ‘experimental store’ in Colorado, where “…more than 500 tons of Denver Stapleton Airport’s runway, crushed up and recycled, have been used in the store’s foundation. And the used vegetable oil from the store’s deli and used motor oil from the store’s Tire and Lube Express will be burned to help heat the store.” Yay. 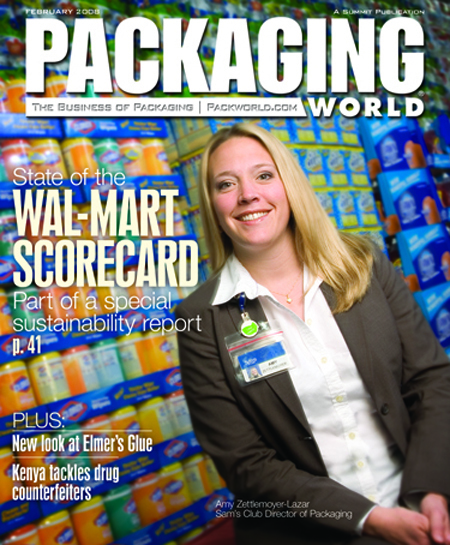 The Wal-Mart Packaging Scorecard is to be used “as a measurement tool to allow suppliers to evaluate themselves…based on specific metrics [that] evolved from a list of favourite attributes…known as the 7 Rs of Packaging.” They are: Remove, Reduce, Re-Use, Renew, Recycle, Revenue (economic benefit) and Read (education). Well Wal-Mart’s sure not doing much to educate anyone in the Vancouver area—nor is any retailer. We’re now in our third month of a garbage strike. Responsible (and PR-savvy) retailers should be buying airtime to ask consumers to hang onto non-food garbage until the strike is over. They’re not. And all of their well-designed, colourful, paper- and plastic-intensive packaging is now flowing out of bins all over the city. This editorial was inspired when a great chunk of Styrofoam became stuck to my windshield. Meanwhile, the Forest Stewardship Council is making very little headway with the packaging industry—only the higher-end frozen food manufacturers are starting to incorporate FSC-certified paper. And given the value of packaging as a sales tool, the amount of information required on packaging, and the engineering requirements of packaging design, I’m not optimistic. The other day, I bought a bottle of room spray, which promised ‘all-natural ingredients’. I do pay attention to packaging and won’t buy something that’s over-packaged. This product appeared to be in a light box. When I opened that box, there was another box. And a silk ribbon. The ‘all-natural’ thing should have also meant that all members of the company’s delivery change were on the same Eco page. The second box was not required for product safety; the ribbon was just a waste. 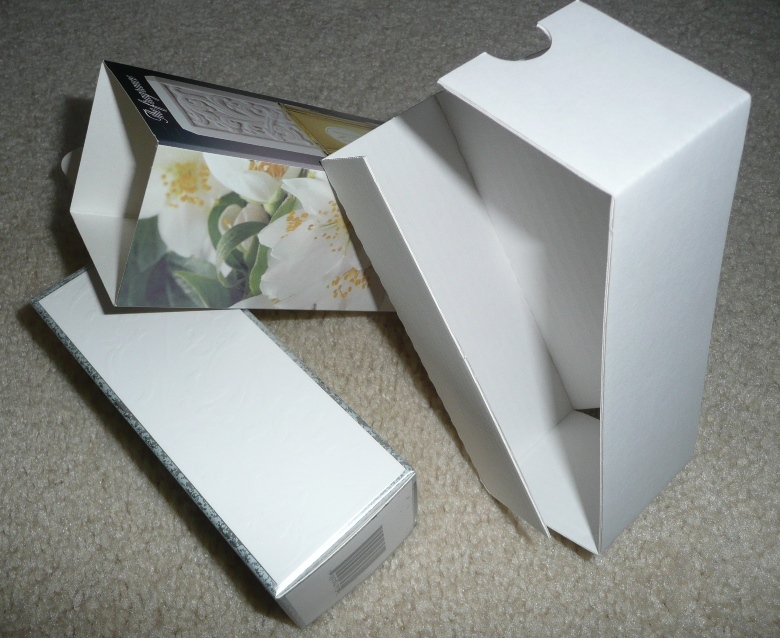 Its packaging designer, therefore, created unnecessary waste, and expense, for all concerned. As for Wal-Mart, if it started supporting the economies of the communities in which it operates and selling things manufactured in North America, perhaps it could do away with over-packaged lead-laced toys. Another one of my favourites is that endlessly-troubled retailer, Cotton Ginny. In a mall last week, I noticed that one of its stores is being re-designed with decidedly earthy colours and an eco-sensitive feel. Which is endlessly amusing, given that cotton growing is one of the most chemically-intensive of all farming operations. 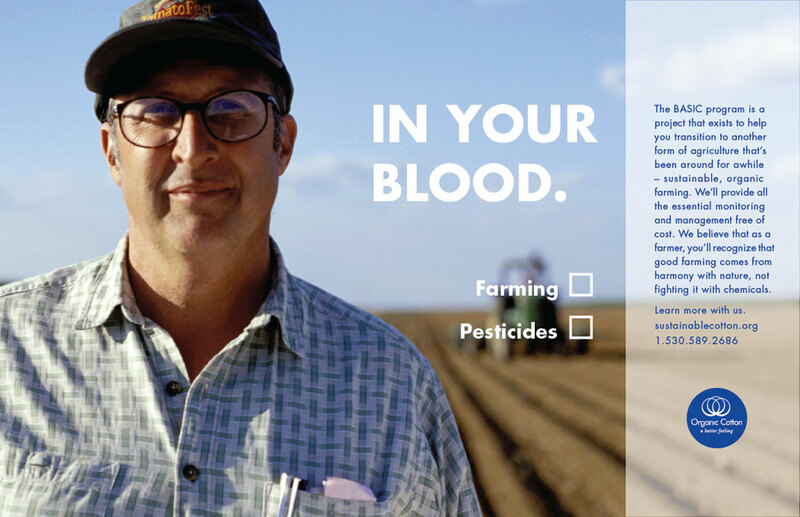 According to Earthshine, 10% of agricultural pesticides produced worldwide (including 25% of insecticides) are used in cotton production. The Sustainable Cotton Project says that five ounces of chemicals go into the production of a single t-shirt. These chemicals include neurotoxins, developmental disruptors, carcinogens and reproductive toxins. And cotton accounts for about half of all textiles produced. Drag. Huh? Who came up with that? And what in Sam Hill is that supposed to mean? I’m sure that one of the more successful ad campaigns in history was conducted by the International Cotton Association. Remember ‘The Look, the Feel, of Cotton?’ Everyone just felt great about buying cotton. With increased environmental awareness, I wonder if (hope) that will change. Cotton Ginny now has an ‘Organic Program’, and it is, believe it or not, offering a line called Eco-ganic Baby. It’ll probably do well. But maybe it will have to change its name, to something equally-inane, like Hemp Honey. Marketers have to get with the eco program—their clients are lagging laughably far behind and it’s time to put an end to this head-in-the-sand situation. Increasing consumer awareness will create drastic changes in buying habits. Everyone’s bottom line depends on making adjustments so that consumers will want to buy their products and services. Production has to change. Packaging has to change. A sense of corporate responsibility has to come out of the closet. Green-ish ain’t good enough.